A pretty series ideal for the fast approaching Spring and Summer season. With floral motifs and silken matt plated butterflies this one will really lift the spirits. It combines carefully applied enamels with faceted crystals, glass and quartz beads to produce items that are both beautiful and very wearable. Available in satin silver plate with white, vanilla and clear colour palette OR satin gold with multi-coloured palette. 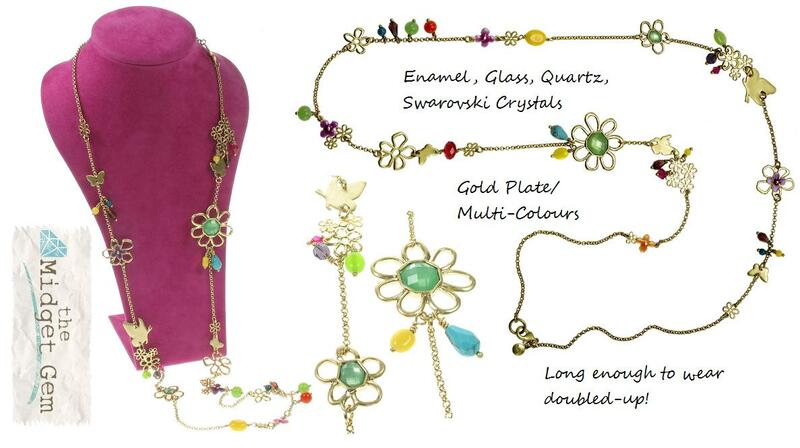 The Bohm ‘Delicate Trinkets’ necklace, pretty ‘Y’ shaped drop focal, largest flower measures 3.5cm/35mm. Length of front drop approx. 8cm/80mm. Adjustable length 16.5 inches/42cm up to 19.5 inches/ 50cm. 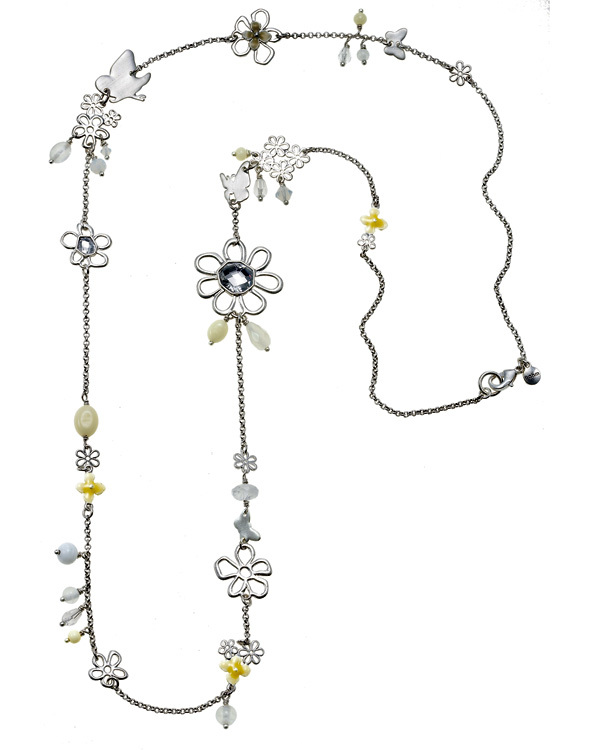 The Bohm ‘Delicate Trinkets’ necklace, pretty beaded cluster and cascading chains focal (this chain matches the neck chains), largest flower measures 3.5cm/35mm. Length of front drop approx. 7.5cm/75mm. Double stranded chain: a fine curb (1.6mm); and a rolo link (2.5mm). Adjustable length 16 inches/40.5cm up to 19 inches/ 48cm. The Bohm ‘Delicate Trinkets’ necklace, pretty detail to most of the chain’s length. The largest motif is the butterfly at 2.3cm/23mm. Length of front drop approx. 3cm/30mm. Adjustable length 16 inches/40.5cm up to 19 inches/ 48cm. Rolo link chain approx. 3mm. 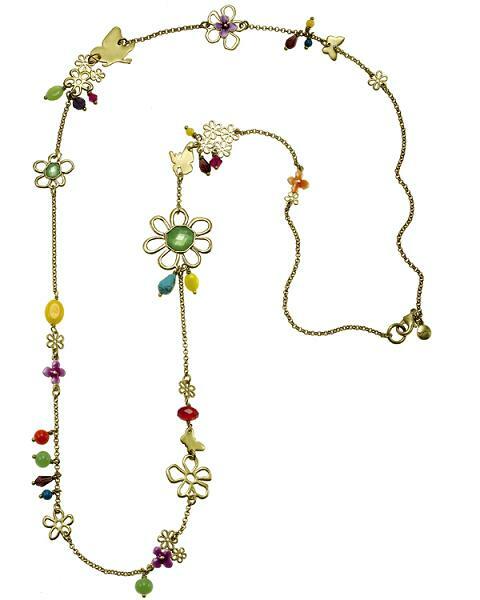 The Bohm ‘Delicate Trinkets’ long length necklace, pretty detail to most of the chain’s length. Long enough to achieve two wraps for a shorter length look. The largest motif is the flower at 3.5cm/35mm. The crystal studded and enamelled flowers are decorated on both sides. Length is 42 inches/107cm with lobster clasp. The Bohm ‘Delicate Trinkets’ adjustable bracelet. Largest flower measures 3.5cm/35mm. Adjustable length 7.5 inches/19 cm up to 8.75 inches/23cm. The Bohm ‘Delicate Trinkets’ pretty hair band. 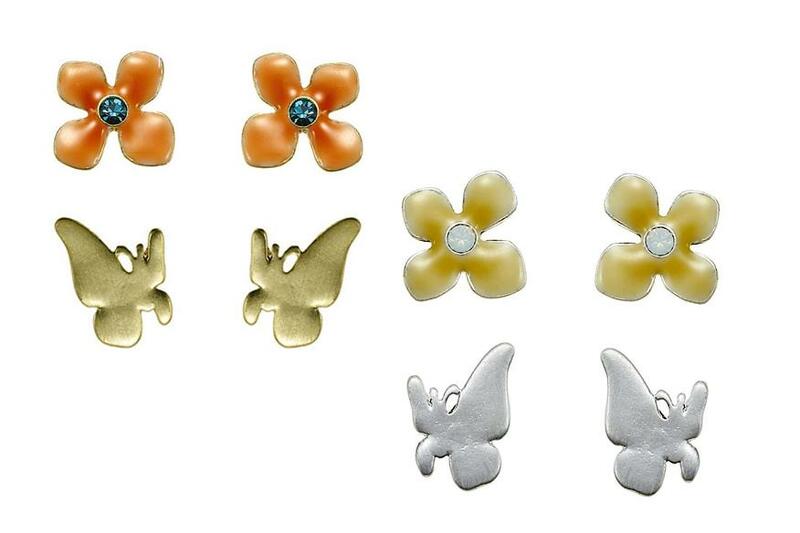 Various flower and butterfly motifs measure 7mm up to 1.5cm/15mm. 15 inches/38 cm in length. It expands comfortably to fit. The Bohm ‘Delicate Trinkets’ stud style earrings for pierced ears. Post with bullet type backing. 1 pair satin plated butterflies 1.6cm/16mm. 1 pair enamel flowers with crystals 1.5cm/15mm. The Bohm ‘Delicate Trinkets’ stud style earrings for pierced ears. Post with bullet type backing. 1 pair of flower silhouettes with central faceted crystals - stunning! Flower measures 2cm/20mm. The Bohm ‘Delicate Trinkets’ hoop style earrings for pierced ears. Post with French clip type backing. Various motifs measure 5mm up to 1cm/10mm. Hoop diameter 3.5cm/35mm.